As I mentioned in my last post, the Bach Music Festival also featured free lunchtime concerts last week at the Trivitt Memorial Anglican Church in Exeter. As well, eight local restaurants offered take-out lunch specials to enjoy during the concert. I pre-booked take-out lunches for my Mom and I from Eddington’s the day before and picked it up shortly before noon last Friday. 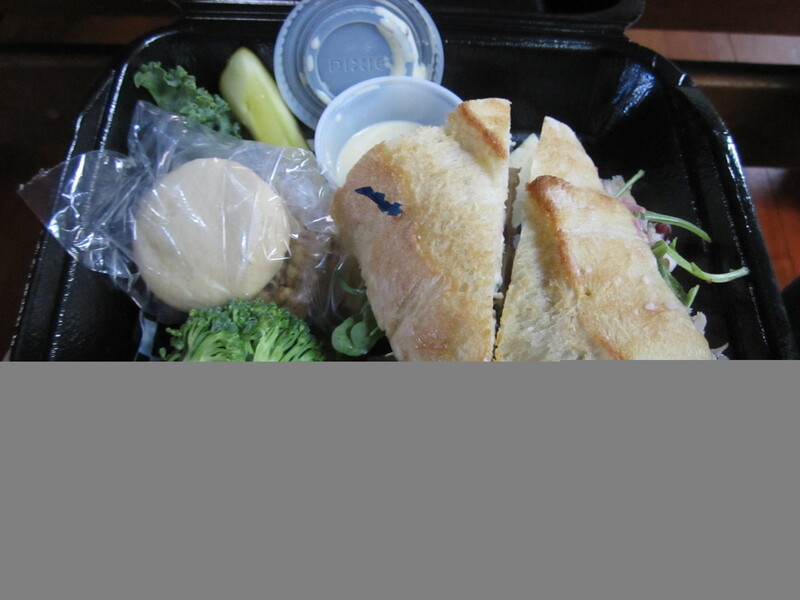 Eddington’s had a $10 lunch special which included a sandwich, fresh cut veggies and dip, cookies, and a drink. I had the turkey and brie sandwich with cranberry aioli, and my Mom had the smoked salmon and cucumber rye sandwich with cream cheese and fresh dill. Both lunches definitely hit the spot on a very hot summer day! It did feel a little odd eating lunch in the church sanctuary, but many others of all ages were quietly enjoying their lunch while listening to the free concert. The Friday concert was titled “Fields of Gold” and featured local music graduates Melissa Bakelaar Van Rootselaar (flute), Aaron Neeb (horn), Katherine Napiwotski (vocal), and Michelle Roy (trombone). It was evident from listening to the 45 minute concert that we have lots of young musical talent from Huron County! The concert was an enjoyable way to spend a noon-hour in the summer and nice way break from my usual lunch-time routine.